Taken on Jul. 6, 2017 the stunning photo in this post features an A-10C Thunderbolt II departing after receiving fuel from a 340th Expeditionary Air Refueling Squadron KC-135 Stratotanker during a flight in support of Combined Joint Task Force – Operation Inherent Resolve (OIR). 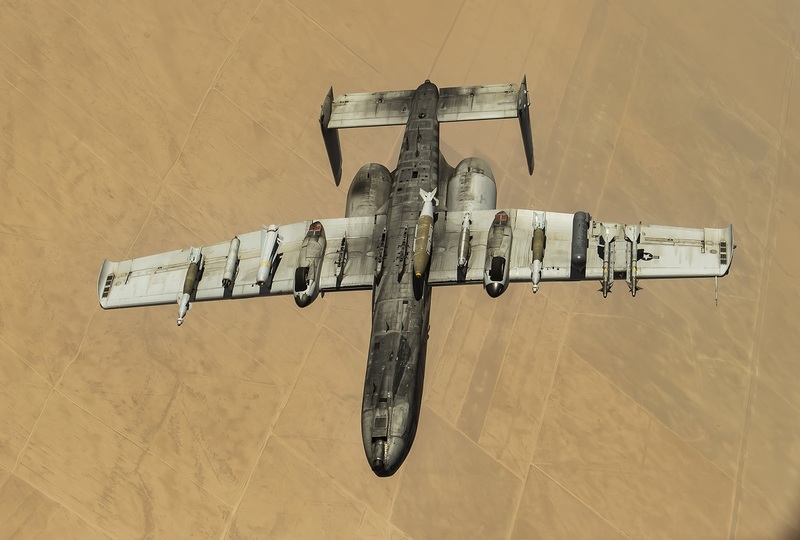 As it can be seen in the photo the A-10C employs a wide variety of conventional munitions in support of OIR and the destruction of the Islamic State of Iraq and Syria (ISIS). The Warthog (as the A-10 is affectionately dubbed by its aircrews) in fact can carry laser guided bombs or LGB (including up to four 2,000lb GBU-10s or six 500lb Gbu-12s), joint direct attack munitions or JDAM (which initially included four 2,000lb GBU-31s or six 500 lb GBU-38s subsequently integrated by the 500lb GBU-54 Laser-Guided JDAM or LJDAM), wind corrected munitions dispenser or WCMD (including six CBU-103/104), AGM-65 Maverick and AIM-9 Sidewinder missiles, rockets, illumination flares, and the GAU-8/A 30mm cannon, capable of firing 3,900 rounds per minute to defeat a wide variety of targets including tanks. Noteworthy inn 2005, the entire A-10 fleet began receiving the Precision Engagement upgrades that include an improved fire control system (FCS), electronic countermeasures (ECM), upgraded cockpit displays, the ability to deliver smart bombs, moving map display, hands on throttle and stick, digital stores management, LITENING and Sniper advanced targeting pod integration, situational awareness data link or SADL, variable message format, or VMF, GPS-guided weapons, and upgraded DC power. The entire A-10 fleet has been Precision Engagement modified and now carries the A-10C designation.